Clays have traditionally been linked to health care, being used for centuries in the fight against infections and diseases. Similarly, biohybrids produced by combinations of clays and biological species through ‘bottom-up’ approaches have been evaluated over the past decade for biomedical and pharmaceutical uses. These biohybrids show interesting features such as biocompatibility and biodegradability which make them suitable for healthcare applications. The aim of the present communication was to review recent research contributions describing progress and the role of biohybrid materials based on clays in biomedicine and pharmacy disciplines. Emphasis will be on the authors’ own experience of this topic, particularly on aspects related to controlled drug-delivery systems, adjuvants of vaccines, and vectors for non-viral gene transfection. Bionanocomposites offer several advantages for use in the design of new and efficient pharmacological formulations for cutaneous and oral administration. In these systems, the drug is typically entrapped in the clay and protected by a biopolymer matrix, and both components contribute to a gradual release of the drug. Clay-based hybrids have also shown their efficacy in vaccines as they can act as nanocarriers of viral particles, due to the biomimetic interface created on the clay surface after adsorption of suitable biomolecules such as phospholipids, while the clay acts as an adjuvant to increase the efficacy of the vaccine. 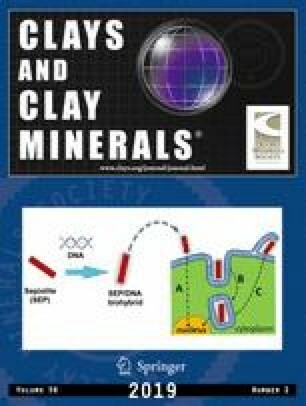 Finally, a new application of clays as non-viral vectors for controlled gene delivery is attracting increasing interest in the treatment of diverse diseases; clays such as sepiolite have demonstrated their ability to act as nanocarriers of nucleic acids and facilitate their transfection in mammalian cells. The authors acknowledge the financial support from MINECO, Spain (MAT2015-71117-R), and the EU COST Action Program (MP1202). B. Wicklein acknowledges MINECO, Spain, for the Juan de la Cierva grant (IJCI-2015-23886). The authors thank Dr. O. Piétrement and Dr. B.S. Lopez for fruitful discussions about sepiolite-DNA gene-transfer results. https://en.wikipedia.org/wiki/Biblical_and_Quranic_narratives. (2018) Accessed April 2018.